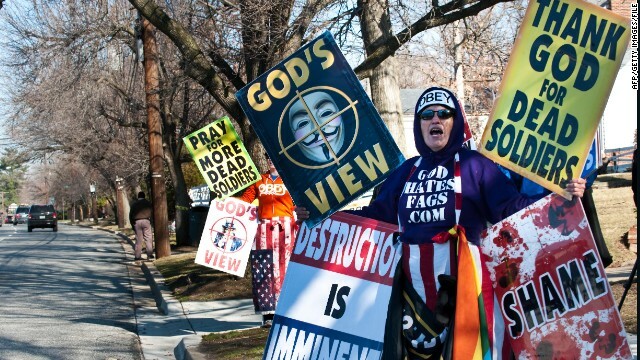 Shirley Phelps-Roper of Westboro Baptist Church protests. Despite disagreeing with the church, the White House says it can't label Westboro a hate group. (CNN) –The Obama administration will not label Westboro Baptist Church a hate group, saying it's not the government's practice to apply the designation. Four related petitions, including one calling for the Internal Revenue Service to revoke Westboro's tax exemption, also garnered more than 300,000 signatures. A White House official, speaking on background, told CNN that petitions that cross the threshold of 100,000 signatures are reviewed by policy staff and receive a response. On Tuesday, the White House posted its response to the Westboro petitions. Officially, the response to the requested hate group designation was "no comment." "As a matter of practice, the federal government doesn't maintain a list of hate groups," the White House said. Instead, labeling hate groups is the job of private groups such as the Southern Poverty Law Center and the Anti-Defamation League, the White House said. But the administration did comment on other aspects of the petitions, agreeing that protesting at military funerals - one of Westboro's favorite practices - is "reprehensible." An animated map posted online shows what the White House says is opposition to the church spreading across the country.